There was a great topic in a recent article of Ask the Builder by Tim Carter about some common problems with Trex and other composite decking. These composite decks are typically less maintenance than a wood deck, but aren’t no maintenance. Tim points out that Trex has a good cleaning guide on their website. He has had the best luck cleaning trex with oxygen bleach applied with a stiff broom. Dealing with gophers and moles can be a difficult and frustrating problem. 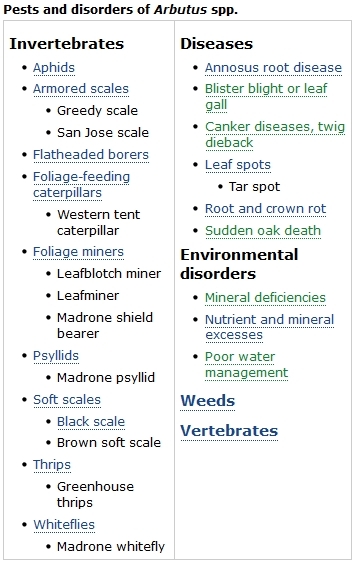 There are a number of treatment types to address gopher problems (e.g. traps, sprays, mechanical barriers, noise deterrents, toxic baits). What is the best way to proceed to eliminate gophers from the garden? We are currently working on a project where we are going to install a mechanical barrier (gopher wire and gopher baskets) for all lawn and planted areas. This is an expensive solution for large areas, and it isn’t bulletproof, but it helps insure there aren’t problems with gophers harming newly planted areas. chewing gum or laxatives in burrows in hopes of killing gophers. This leaves trapping, baiting, or barriers as the best ways to deal with gophers in the garden. We had a couple of calls this week from clients that their fountains were not working. 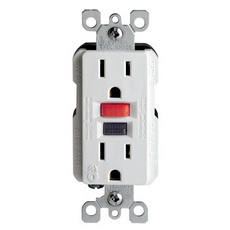 Nine times out of ten this is due to a GFI (Ground Fault Interrupt) plug, which is common in kitchens or bathrooms and can prevent against shocks. From time to time these may trip and need to be reset with the red button on the plug. If there ever is a problem with a lighting transformer, fountain pump or irrigation controller check the plug first to see if the GFI needs to be reset. Here is an insider’s view of some helpful tips for hiring a contractor and questions that you should ask during the first meeting/consultation. 1- Take notes: Frequently, when I talk with prospective clients they do not take written notes of our consultation meeting. In my mind this is a mistake, as the contractor I always take notes of all the projects I go on relating to scope, budget, project background, client preferences etc. When hiring a contractor if you don’t take detailed notes and talk to multiple contractors it may difficult to remember the details. 2- Before the first meeting/consultation discuss the details: Many times when I go on a consultation, the first time a husband and wife discuss their wants and the project scope in depth is when they first talk with me. This is a mistake- the more clarity you can have going into the first meeting, the better the contractor will be able to meet your needs. It often helps to have a list typed out of the elements, key considerations or design details you want for the project. Give a list to each contractor you talk to, it will help them meet your needs, and make their estimate more accurate. If there are disagreements about what type of spaces you want, what you want to spend, or other key considerations, discuss them before you meet with potential contractors, not during the first meeting. 3- Ask about the Company’s Resume: When interviewing a job candidate for a position, the key point of reference is their resume. Ask the same type of questions of the contractor- if they have a website use this to do some research as well. -How long have you been in business? Tell me about the owners, what background do you have in the industry? -Who will I be working with throughout the project? -What does your typical job look like? -How do you handle contracts and change orders? -Do your crews/employees do the work? Do you use subcontractors? -How long does a typical project take to install? 4- Do your homework: The more information you have going into hiring your contractor, the more you will be able to make an informed decision on selecting a company that fits your needs. -Look in the neighborhood for examples of projects, styles, materials or particular detailing that you like. In many projects it seems you use ‘landscape ties’. Are these the same as railroad ties or are they the pressure treated version of railroad ties? The reason I ask is that I don’t like the look or pressure treated wood but am concerned about leaking railroad ties. 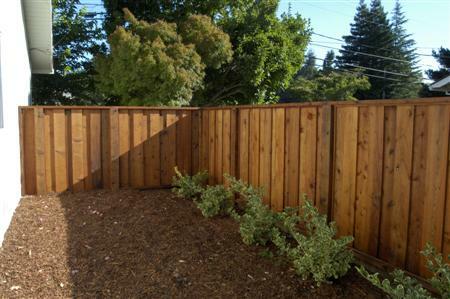 A: Landscape ties are nothing more than pressure treated Douglas Fir, typically 6×8. There are a few of different methods for pressure treating- with either a greenish, reddish, or blackish tint (without getting into the different types of chemical treatments used- check with your local lumber yard for the type of pressure treatment that is best for a particular application). Railroad ties, strictly speaking are black in color and coated with Creosote and a number of other chemicals that you really wouldn’t want to use in a residential setting. I hope this explains the difference and our nomenclature. After talking with a prospective client recently, an issue came up that can frequently be confusing when installing a new landscape- how much is it going to cost? There is no easy way to answer the question, or any absolute formula or cost per square foot to apply that can give a perfect idea of cost. Yet, landscaping is a big ticket item, similar to buying a car; you wouldn’t go to the dealership not knowing if you wanted a Honda Civic or a Porsche. Landscaping is often not too different in terms of time required, labor required, and material cost required, than some remodeling projects done in the home. You can spend easily $10-20,000 remodeling a 150 square foot bathroom; a 5000 square foot yard done with similar eye for detail is not going to be in that price range. With that in mind, here is a simplified overview of costing, to give a general idea of what landscape projects cost. 1- Site work: How much grading, clean-up, tear out work is involved. How hard is it to access the site and do the work. Can a Bobcat be brought in or does everything have to be done by hand? 2- Infrastructure: How much work is needed on the underlying systems- drainage, electrical, irrigation, lighting. 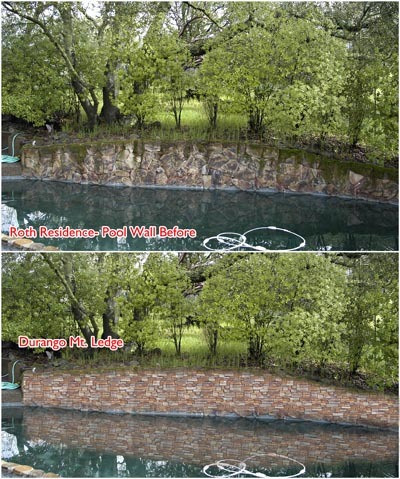 Are there spaces that need to be created with large retaining walls that require drainage and a lot of site work? 3- Hardscape: Usually the most expensive aspect of the project. What are the sizes and lengths of retaining walls required (typical cost $100-400+ per foot), what are the sizes and finishes of patios (concrete, brick, stone? 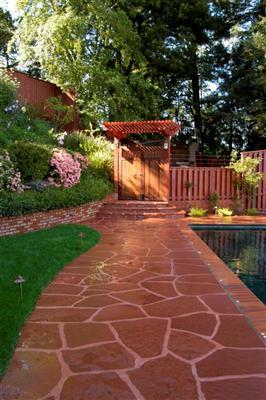 ), walkways and flatwork (typical cost $10-40 per square foot). 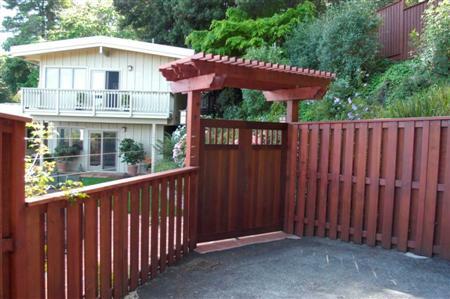 Are there arbors, fences, or gates required? 4- Softscape: How much planting, soil prep and mulching needs to be done? Are plants going to be installed small and allowed to grow, or brought in already mature (e.g. Box Trees)? 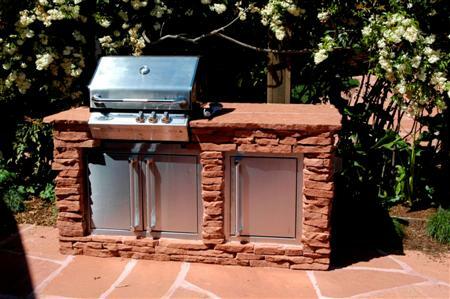 5- Accessory features: Are lighting, water features, firepits, or outdoor kitchens desired? What is the scale and level of detail of these items (Are you looking for the Trevi fountain in Rome or a pre-cast fountain that will fit by the back door?). 1. 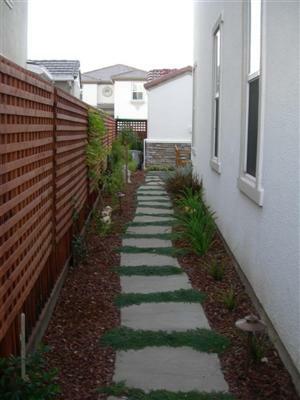 Decide what benefits you are going to receive from the new landscaping. 2. 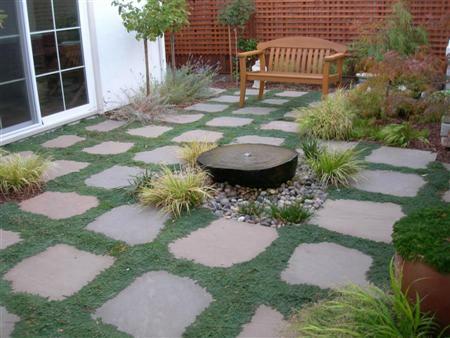 Ask friends and neighbors what they spent for their landscape projects. 3. Determine if there is going to be phasing of the project and think about the total scope, detail and cost of the items associated with the project. These projects that are either on small lots if landscaping both a front or back yard, or focus on a particular area such as just the front or back yard. The design is articulated, but there are not a lot of detail items and accessory features. If those features are present they are typically of smaller scale. If projects are more articulated at this scale it is typically because there was less site work, excavation/retaining, and infrastructure work needed. Small project above included: Irrigation system, small 150 sq.ft. 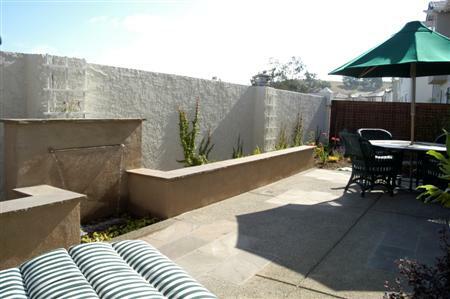 flagstone patio set in sand, border accent plants, back concrete patio with stone accents, seat wall and waterfall. A project at the bottom half of this category would probably have about half of these elements. 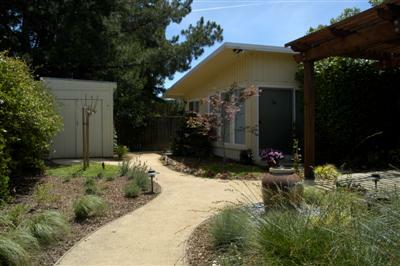 Medium project above included: Back yard only- Irrigation and drainage systems, flagstone patio, lawn (700 sq.ft.) 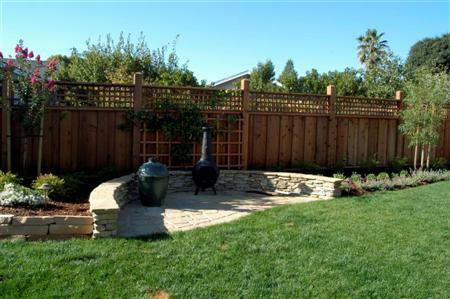 flagstone barbecue area and seat wall, perimeter fencing for back yard, accent arbor, lighting package, small concrete utility area, and linking flagstone pathway. Large landscapes are usually distinguished by more detail work and accessory features of a large overall scale, usually the whole lot. Larger scale grading and infrastructure work is usually required. 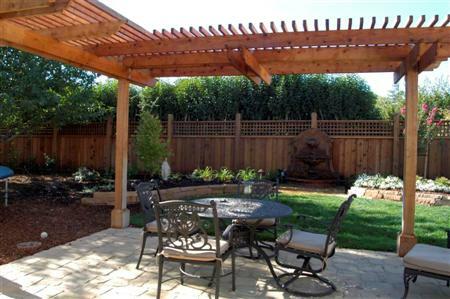 Large project above included: Irrigation and drainage systems, large flagstone patio (1000 sq.ft. ), large deck retrofit, water feature, barbecue island, perimeter fencing and deck railing, entrance arbor, lighting package, front entrance gate and pillars, and linking flagstone pathway. These custom projects are just that, custom. They tend to have a lot of handcrafted detail and more expensive materials. They also typically incorporate more elements, on a larger scale than the project cost categories above. Large scale retaining walls and grading are often required. Plantings typically are installed with larger container sizes and box trees (the cost of large box trees can equal a small scale project). Custom project above included: Extensive retaining walls and engineered patio area, decorative stone veneer walls throughout, linking flagstone pathways for front and back yard, custom cedar fencing, gates and trellises, large stone patios, large lawn areas, several large box trees, drainage, irrigation and lighting systems, and well articulated planting beds. Q: Please advise us as to sealing Rosa Az. Flagstone from the Tucson area. We live in Sacramento, CA. 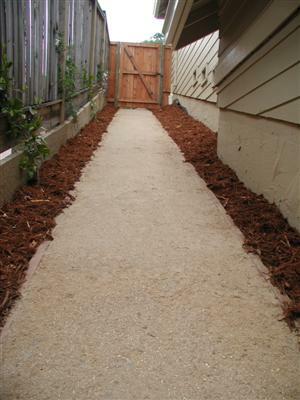 We are installing a small patio of this material on 2″ of crushed rock, then 2″ of sand. We are putting polymeric sand in the joints. 2 people have advised us that it is not necessary to seal the flagstone. They advised that, because the flagstone is so porous, it would use too much sealer. Also, they said that leaving it in it’s porous state would help keep it more breathable for less algae growth. We are a little worried that, without a sealer, it will stain too much, as it is so porous. Thank you so much for your help!!! My husband is a Tucson native, and we are really excited about this flagstone. We typically don’t seal Arizona flagstone, as far as the amount of sealer necessary, I wouldn’t doubt the advise you have received. As far as algae comment, we don’t have any experience with sealed vs. unsealed- algae is typical in Arizona because of its porosity, and is best removed with a pressure washer and/or push broom with diluted acid wash (Muriatic pool acid), although in some rare cases this can cause efflorescence in the stone. We have not been impressed with the weathering of some of the stone sealers out there. If you are looking for particular brands, Aldon is one we have used in the past, or you can visit your local stone/masonry supply yard or tile dealer. There are some high end (expensive) sealers out there for stones tiles like travertine, that seem to be better. Remember with any sealer or stain used outdoors, it is exposed to lots of moisture, heat, and sunlight, especially in the hot valley summers, so expect results accordingly. Good luck with the new stone. There are three types of mowers typically used by homeowners for residential lawn care: Gas powered mowers, electric mowers and manual push mowers (reel mowers). 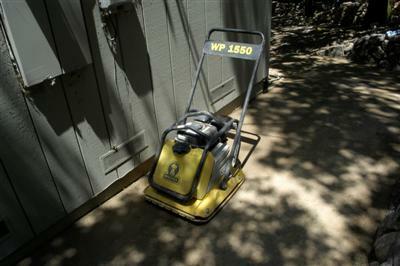 Gas mowers are used commercially, but can be a headache for homeowners with smaller lawns. Electric mowers offer ease of use and operation and don’t have inefficient polluting engines, but sometimes cut quality is not as high as with gas mowers. Reel mowers offer great cut quality, but don’t bag grass and take sweat effort on the part of the operator (they are great for small lawns). Black & Decker and Yard Machines. Hybrid electric reel mowers are also available. An interesting idea for people who want an electric mower that will mow the lawn for them is this Robotic mower. How this works is a mystery to me, but if it works for vacuums, maybe it can work for lawn care. A question we frequently get asked on our projects is how we accommodate rain and our project schedule. Certainly the rain has an effect on the speed and types of work that can be completed. Just because it is raining however, does not mean things come to a standstill. Often there are detail aspects; irrigation, clean-up, and other special features that can be done in lieu of hardscape elements such as retaining walls, stone or concrete surfaces, which can be impacted by the weather. There are also mitigation measures that can be taken to keep working. Often we construct temporary shelters to continue setting stone masonry, or we cover the site with large sheets of plastic to minimize water absorption in the soil. In the end, sometimes nothing can be done but to work through it and make the best of the weather conditions and get a bit muddy. 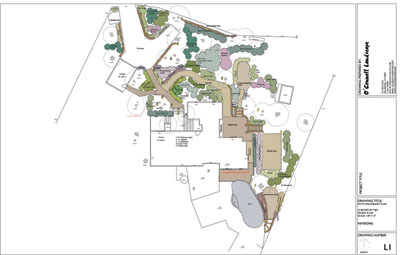 Drafting: We use Vectorworks, a popular alternative to Autocad (which is the industry standard). Typically detail drafting is done in Vectorworks, which is well suited for residential landscape planning. Image Processing and Plan Presentation Drawings and Graphics: We use Adobe products Photoshop and Illustrator for image processing. We will draft a plan in Vectorworks and then color and manipulate it using Illustrator. Photoshop is used for digital mock-ups and image improvements. 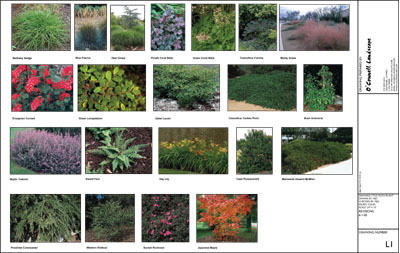 Plant Selection: We use a couple of plant databases to help with plant selection. PlantMaster is a regional California database that we use to select plants based on cultural requirements; soil type, water use, aspect, characteristics etc. We also use Horticopia, a National database, with an excellent image library, so that clients get a good idea for the plants to be installed. Other Software: Some other useful software applications we use in the design process. One of the major challenges we face in planting in Marin and Sonoma Counties is deer. The wooded slopes and open space are beautiful amenities to the local community, but also serve as great habitat for deer. 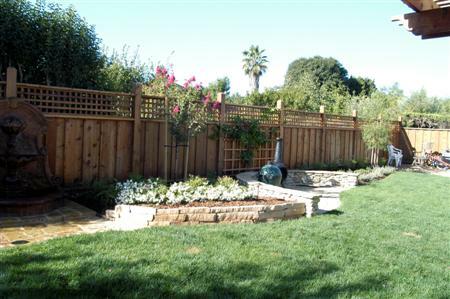 In most areas any unfenced plantings need to be deer resistant. Notice that I say resistant and not deer proof. This is a major distinction. Just because a plant is on a deer resistant list does not mean it is deer proof. If the conditions are right deer can and will eat almost anything. This is not to say that there are not some plants that deer will rarely eat, but there is no such thing as a deer proof plant. One product that we use on newly planted material (deer love juvenile foliage on plants they are not supposed to eat) is Liquid Fence. It is a deer repellant designed to be applied frequently at first, and then periodically once deer have been “trained” to stay away from your plants. We have found this product to be a moderately effective solution to deer “proofing” plantings if applications are made regularly. I received a question today about the types of available decomposed granite (DG). This can be a bit confusing because there are a few different options for DG. DG is essentially a combination of small granite pieces and granite fines. The fines in the DG make the material well suited for pathways and areas where it can be compacted. Typically we compact our DG installations with a vibrating plate compactor. DG comes in two basic color ranges, brown and gold. The material is usually installed one of three ways. 2. DG with stabilizer agent: A stabilizer agent is mixed into the DG which prevents the material from moving around as much and gives it a more hard packed appearance. The material will still form a bit of a sandy layer on the top but it is much better than the untreated DG. 3. DG with Resin or “Poly Pavement”: The DG is mixed with a natural resin which creates a natural asphalt like material. This is the most expensive type of DG installation and we typically use it in high traffic areas, ramps and steps down hillsides, or driveway surfaces. It is frequently used in wineries for access paths and drives. The material will not run, and does not have a sandy consistency like the other types of DG. While these additives make a great surface, the DG can become eroded if not protected from repeated water erosion. The most frequent culprit here is gutters or downspouts where constant dripping can erode the material. DG is a great material where the design aesthetics are such where concrete would not work well or where a more rustic and natural look is desired. Both the untreated DG and the stabilizer will get somewhat muddy during rainy periods, so we recommend DG with resin for areas where access is heavy year round. 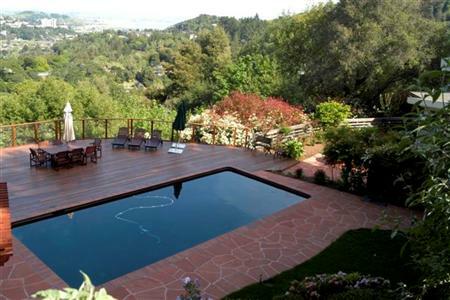 Redwood, Cedar: These two softwoods are traditionally used for wood decking. They have a nice appearance, but require staining and upkeep to look their best. Because they are softwoods they also weather and eventually rot faster than some alternatives. Composite Decking: Composite or Plastic Decking is a synthetic product made of a composite of wood particles and plastic. Is requires much less maintenance than traditional softwoods, and is rated for a longer life span. The drawback of the composite decking is its appearance. While new technologies and products are available that are more realistic looking, they still do not fully approach the beauty of natural wood. Hardwood Decking: Brazilian Walnut (also known as Ipe or Pau Lope) is a tropical hardwood that is several times stronger, denser and heavier than softwoods. It is highly fire resistant and has great structural properties. Unfortunately it is also the most expensive of the three options. The wood has a beautiful appearance stained (like that of a fine interior hardwood floor) but requires continual repeated staining in exposed areas (once per year). If the wood is not stained it can be treated with a wood seasoner (Seasonite) and allowed to turn silvery gray (think weathered teak). We recently received a call from one of our newly completed landscape projects. They were calling to express concerns that aphids were eating their newly installed landscape plants. As such, they wanted us to spray to stop the infestation. This is why we need to practice patience when spraying insecticides. Sometimes we have to let nature take its course and that means having to tolerate aphids on our roses in order to give the predators a chance to kill the infestation. Sometimes spraying is not the answer, patience is.